Beginning in the aftermath of Batman v Superman: Dawn of Justice, the latest summer blockbuster spinoff/ sequel Suicide Squad has Guardians of the Galaxy’s August box office records well in striking distance, hitting cinemas this weekend as the third film in the DC Extended Universe franchise. Much like its predecessor experienced in March, the latest movie featuring beloved characters from the storied comic book pantheon met largely negative critic reviews despite overwhelming audience and fan support. Say or believe what you’d like about the great American rivalry between Marvel Comics and DC, but Warner Bros. and the latter certainly have developed a reputation for divisive films that refuse pandering to critics. Director David Ayer (End of Watch, Fury) lends his talent for shooting chaotic violence to a movie with a chaotic premise. Those expecting DC to make good on their description of a Dirty Dozen­-type plot will feel disappointment from the glamorous approach to the material. However, the multitude of pop culture fans will enjoy the audacious antiheroes and familiar soundtrack. The reveal of Superman to the world in Zack Snyder’s 2013 film Man of Steel triggered a chain reaction of magical, cosmic, and supernatural phenomenon. In his absence, another plan must replace the United States government’s failsafe should another intergalactic/ inter-dimensional event threaten Americans. Suicide Squad opens on a forgotten super-max prison, Belle Reve, in the Louisiana swamp. This prison contains several dangerous criminals with extraordinary talents who have crossed the likes of Batman, the Flash, and other super heroes. When a plan to force these criminals into violent service for the US government backfires, the very same criminals must ironically serve anyway to save a world without Superman. Like every actor to bear the role preceding him, Academy Award-winner Jared Leto (Dallas Buyers Club, Requiem for a Dream) steals the show as Batman’s iconic arch-nemesis. Unfortunately, his presence isn’t entirely necessary to the overall narrative, but the film wouldn’t be as fun without his dash of chaos and reign of terror to shake things up for the titular team. The Clown Prince of Crime isn’t a part or member of the Suicide Squad nor does he take primary antagonist duty, instead appearing as a controlling love interest of Harley Quinn. Leto brings a unique flavor to his Joker, giving the truest on-screen performance of the comic book icon all the way from the mean 1940s gangster to the macabre present day terrorist genius. Viola Davis (The Help, “How to Get Away with Murder”) nails the role of ruthless bureaucrat Amanda Waller. Concocting the seemingly insane idea and monitoring them everywhere they go, Davis’ performance reflects the Waller seen on comic book pages since the 1980s. When Waller suggests using incarcerated criminals for government missions, her plan of keeping them honest involves forcibly injecting a remotely detonated bomb implanted deep in their necks. Throughout Suicide Squad, Davis never misses an opportunity to reveal the depths of Waller’s arsenal, means, and information. She may work in the American government, but make no mistake that Amanda Waller casts a bigger, darker shadow than the bad guys who work for her and shows less evidence of a soul. Will Smith’s Focus co-star Margot Robbie (The Wolf of Wall Street, The Legend of Tarzan) steals every scene not to feature her cinematic romantic counterpart. Playing the role of comic book villainess “Harley Quinn” for the first time in a movie certainly came with a lot of pressure, but Robbie knocks it out of the park. Although her role definitely won’t further women’s roles in Hollywood blockbusters (but Davis as Waller just might), the actress fluidly pulls off Harley’s well-documented obsession with her puddin’ Mr. J, and trademark penchant for violence. The harlequin-themed character begins the film serving time at Belle Reve, but her mission with the Suicide Squad allows the Joker an opportunity to “rescue” his significant other – further complicating Waller’s plan. The rest of the supporting cast gives a solid collective performance despite the fact that not every Squad character gets the amount of screen time and attention as Deadshot and Harley Quinn. Joel Kinnaman (RoboCop, “House of Cards”) plays Waller’s man on the team, Rick Flag. Flag keeps the squad in check as the soldier with more of an interest in the mission than he’s willing to let on to his criminal teammates. 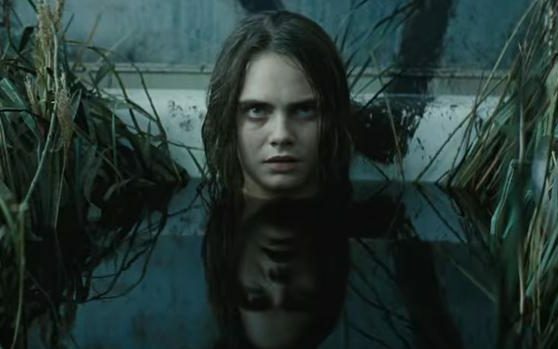 Cara Delevingne (Paper Towns, Pan) plays June Moone/ Enchantress, a 6,000-year-old witch with mystical, terrifying powers. Unfortunately, Delevingne’s role gets significantly reduced after the first act when the majority of her lines get unashamedly dubbed. Jay Hernandez (Hostel, Bad Moms) gets a few scenes to shine as the cursed, tattooed El Diablo. The most powerful member of the group, El Diablo represents the only remorseful criminal due to his tragic, violent past. Despite the deep cast of diverse, likable characters and impressive soundtrack, Suicide Squad runs into a few problems. Suffering from panic mode at the large, negative reaction to the tone of Batman v Superman, Warner Bros. edited their latest DC film to oblivion. Ayer shot lots of flash back footage to develop his characters and the studio’s multiple un-credited editors clearly took turns cutting it up to chop the pace. Somehow, it still feels too long. There are also simply too many pop hits on a soundtrack that should have taken the time to develop themes for a few of its characters like Deadshot, Waller, and Harley. Think what you’d like about Batman v Superman, the attention to the four main characters’ (Batman, Superman, Wonder Woman and Lex Luthor) accompanying music made for a dynamic cinema experience.